“At a time when we conduct so much business electronically, it’s great to get out of the office and hit the road – especially in a car that’s the epitome of ‘mobile’ advertising," said ASI CEO Timothy M. Andrews. 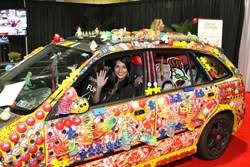 Covered inside and out in a colorful array of promotional products, the ASI Promocar left California today, bound for a 2,700-mile journey across 12 states to drive attention to the $21.5 billion ad specialty industry. The Advertising Specialty Institute® (ASI) created the moving billboard as part of a year-long ASI public relations campaign called “Driving Serious Fun,” designed to publicize the industry’s creativity and ingenuity. The ASI Promocar (hashtag #ASIpromocar) is a 2002 Mazda Protégé ASI employees covered with hundreds of products donated by ASI suppliers, including logoed slinkys, zombie stress balls, cellphone holders, keychains, pens, car magnets, pinwheels, USBs, lanyards, can coolers, light-up ice cubes, T-shirts and flip-flops. Anyone who sees the car during its trip and posts a pic with the hashtag can score a “Driving Serious Fun” T-shirt. Follow the car on Facebook, Twitter, Instagram and on ASI’s website, http://www.asicentral.com. Promotional products are logoed items like T-shirts, caps and pens companies typically give away to promote their business, brand or event or to thank employees or clients. The industry is growing at twice the rate of the U.S. economy. The ASI Promocar will stop in Flagstaff, AZ; Santa Fe, NM; Oklahoma City, OK; Memphis, TN; Asheville, NC; and Floyd, VA before ending its trip in Stockton, NJ and returning to ASI headquarters in Trevose, PA. The Promocar has been on display at ASI trade shows in Chicago, Orlando and Long Beach, CA. May 5-6 it will be at the Javits Center in New York City. Everywhere it goes, people are invited to sign the inside. The lightweight plastic and foam items covering the car were securely adhered with GE Silicone II glue. To date, the car has driven nearly 2,000 miles, and is street legal.